When you are too busy dealing with life to edit your resume for your job search and leave your toxic job, then it’s time to get some help. 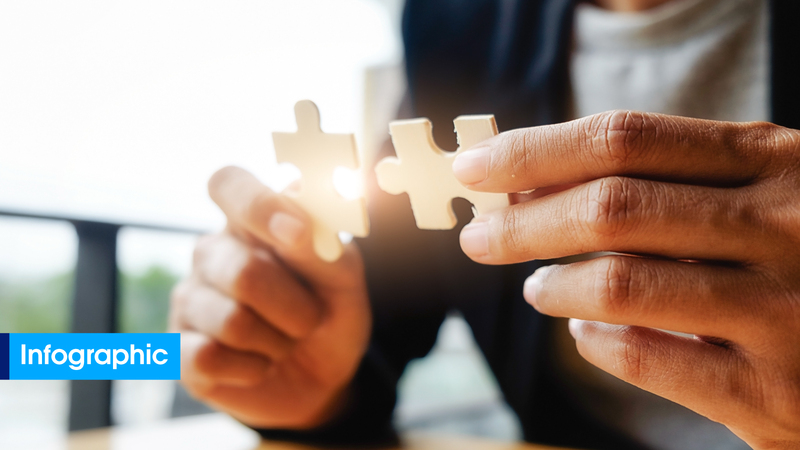 There are many factors that compel a professional to start looking for a new job while still employed — and just as many reasons they might feel trapped or bullied into staying in a dead-end job or toxic situation. Ken Morrison is no stranger to feeling stuck and helpless in his role and turned to TopResume for help and support moving forward in his career. Ken is a self-described “professional tinkerer.” With several patents to his name, his passion for invention led Ken to a lucrative career in programming and business intelligence spanning the last 20 years. His favorite aspect of the job? Helping people understand the data he works with. “I love building reports where you can give information to people — managers, clients, or whoever — and help them visualize information,” Ken revealed. Yet, despite this experience and enthusiasm for the job, Ken is currently employed at a company where his manager creates a toxic work environment for not only him, but all of the programmers in his department. After talking with Ken, we learned he was denied a raise repeatedly, had his job threatened after emailing the IT department about a server malfunction, and received negative performance reviews for seemingly no reason. Along with a boss who is potentially sabotaging his job search, Ken is also nervous to look for a new job because of his age. For Ken, age is a limiting factor. But, regardless of this obstacle, he doesn’t plan on slowing down anytime soon. “I don’t have in mind a retirement age because I like my work. But I know what employers must think about me when I walk in for an interview,” he said. However, age has also been an advantage for Ken. Rather than actively looking for jobs, Ken has grown accustomed to being approached by recruiters who are in need of his technical expertise and extensive experience. In fact, this is how he landed the job he has now. Despite this ongoing attention, Ken has largely ignored their offers due to the state of his resume. For Ken, it’s simple — he doesn’t have the time or desire to rewrite his resume for his job search. And who blames him? 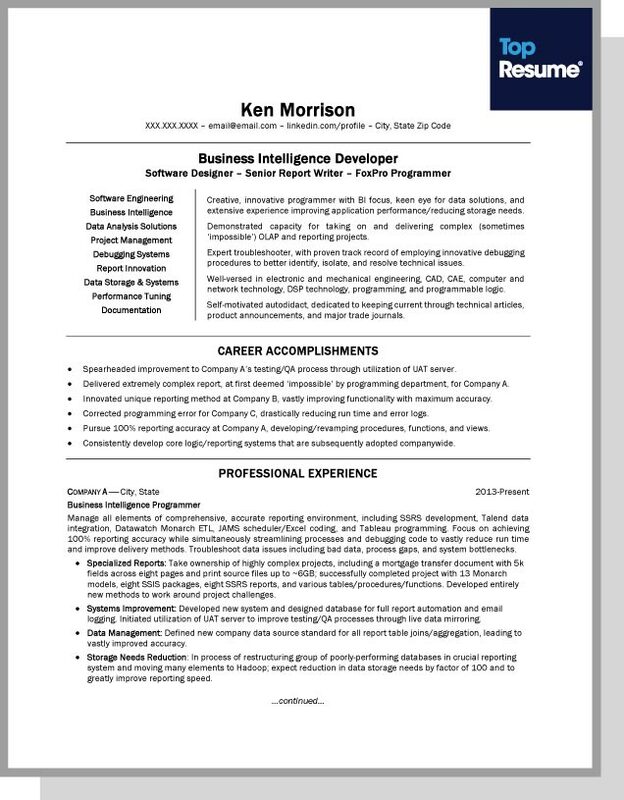 Editing your resume takes a lot of work, especially when you have as much experience as Ken. Knowing which information to keep and which information to cut is no easy feat. The fact that a resume is also an incredibly personal document of your past achievements and future career intentions makes it even more difficult for job seekers to be 100 percent objective. “Everyone always says if you don’t catch them on the first page they are going to toss it, but I hate boiling it down. I want people to appreciate all the different mindsets and talents I bring to the table,” Ken added. Luckily, Ken decided to enter our resume-makeover contest and became this month’s winner. Then, that’s where Anne, one of TopResume’s professional writers, came in. Before Anne put her resume-writing skills to the test, Ken’s resume was six pages long and included much more information than was needed to showcase his skill set. You can check out the first four pages of his “before” resume here. Is your resume looking a little on the longer side? We can help cut it down! Just trust our experts. Some of the major changes that Anne made to Ken’s resume revolved around concision and language, cutting the resume way back. You can see the final product here. 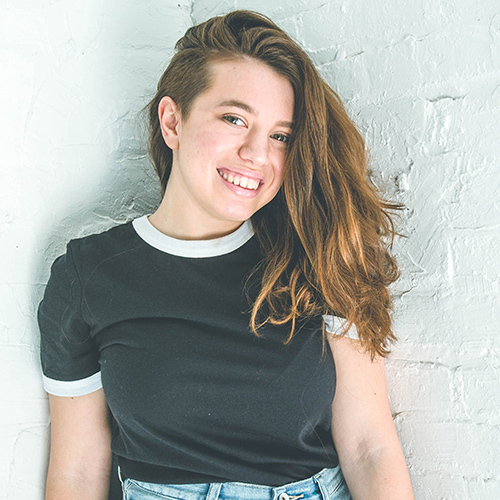 Anne changed the language to what resume writers refer to as the silent first person. By taking out unnecessary “I”’s to keep his resume from becoming repetitive, she helped save precious resume space. Anne grouped Ken’s multiple consulting jobs under “Independent Contractor” and separated them by company and job title, effectively grounding his runaway resume while leaving Ken satisfied that all of his achievements were not being overlooked. She also removed indications of his age by cutting positions from more than 15 years ago that were no longer relevant to his current job search. 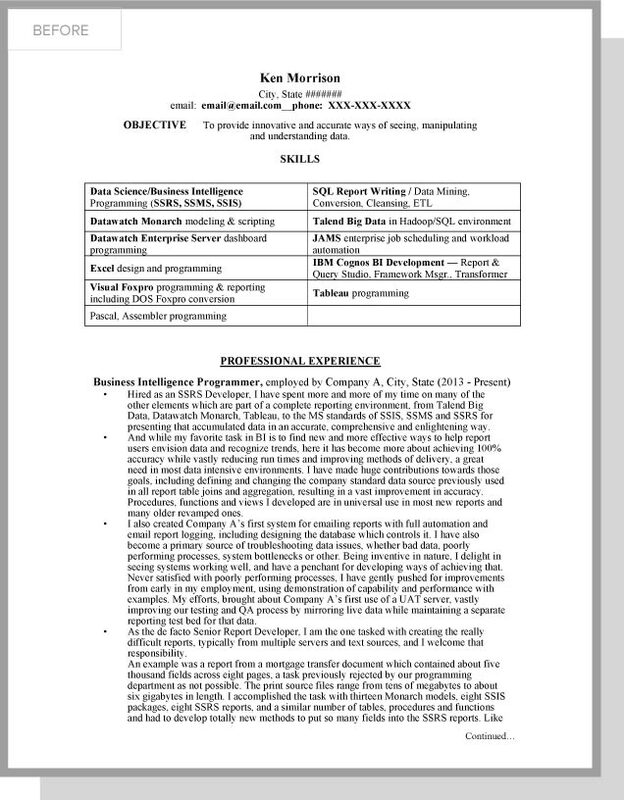 Anne edited his resume to indicate the type of role he wants to work in next, which involves creating and inventing in the business intelligence industry. Instead of describing his achievements as “doing,” she formatted the language to center around what he accomplished in his years on the job, quantifying his achievements to help him stand out in all the right ways. In the end, Ken learned to leave his tinkering for his inventions and let the experts handle his resume. Now, he is no longer ashamed of his resume, and is ready to actively put himself out there. Are you feeling stuck at your job, but your resume isn’t helping? Our TopResume professional writers will help get you out of the resume rut. Check out our packages today!